The best way to discover something special is by accident. Not too long ago, on a vacation in Sicily, my boyfriend and I were weaving through the tight, tucked away alleys of Palermo when we happened upon the Vucciria – an open-air marketplace, over 700 years old, right in the city’s center. We strolled past merchants crowding housewares onto rickety card tables, their backs up against crumbling walls and parked Vespas; past the bakers balancing aluminum trays of biscotti regina atop milk crates and shaky boards. We watched men in white aprons and coppola caps weigh clear-eyed cuts of fish, stopping frequently to pour water over their freshest catch, the cobblestones dark, wet and shining in the sun. We bought jars of pesto di pisatacchi tied with checkered ribbon, and skinny bottles of salty capers. We leafed through baskets of dried herbs, and dipped slotted, metal spoons into olive bins. We touched tomatoes and held bulbous eggplant and chili pepper bouquets with two hands. We pointed at bloody meat dangling under fluorescent light. And then we met a vendor named Rocky. Rocky stood alone behind a three-wheeled street cart in a spacious piazza off the heart of the market. He pushed and scraped at a fatty vat of oily, piping hot meat, patting it down into a soft semolina bun, finishing it off with a squeeze of lemon and a sprinkling of shredded caciocavallo cheese. My friend and I circled him for a bit watching his technique, but mostly wondering what the sandwich was, and if we were looking lunch in the eye. Rocky made the decision for us, and before we knew it, we were looking lunch “in the spleen” as we nervously bit into what Sicilians call “pane ca’meusa” – their beloved calf’s spleen sandwich. Brave souls we were; best accident by far. Did Brooklyn know about this sandwich? 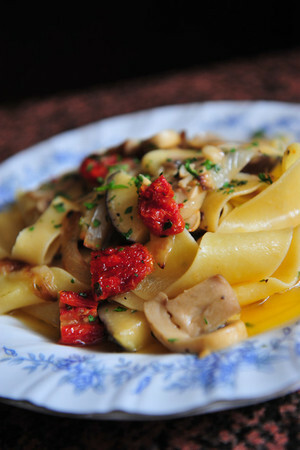 Back home in Carroll Gardens, it came as no surprise to learn that Ferdinando’s Focacceria Ristorante – our neighborhood’s vestige of traditional Sicilian food - boasted “vastedda” (the old Sicilian word for pane ca’meusa) on its menu. But I wondered: Could it rival Rocky’s? Oh, yes. Ferdinando’s spleen sandwich is delicious and, like many other items served here, very special. The organs, soft and juicy, are layered with ricotta and grated pecorino cheese (the two ingredients that turn a staple into a “special”), baked, and then piled onto homemade focaccia. There is nothing shy about this sandwich. Vastedda knows what vastedda is. 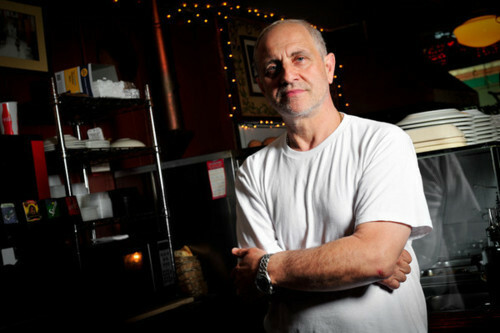 Chef-owner Francesco Buffa, a former policeman and judo instructor, who sold his sports car, moved from Rome to Brooklyn, only to fall in love with Ferdinando Siaramataro’s sole daughter back in the 70s, takes tremendous pride in the preparation of his father-in-law’s authentic Sicilian specialties. When the focacceria’s doors opened in 1904, it was simply a luncheonette for longshoremen, and just three items were offered: panelle, potato croquettes and vastedda. In 1975, just one month after Francesco married into the family, Ferdinando passed away. While it remained important to Francesco to keep the original menu intact, he did want to offer “more sophisticated” plates. Dishes like “pasta con sarde,” “antipasto rustico,” “trippa” and “linguini con seppia” turned a lunchtime focacceria into a popular dinnertime ristorante. Over the years, many customers have fallen in love with the pork chop pizzaiola - a secret dish that doesn’t even grace the menu. Debbie, one of the waitresses, has been describing it the same way for five years. Fabio, 35, grew up in Carroll Gardens and has been eating at Ferdinando’s since he was a kid. The rice ball special is one of the two most popular dishes at Ferdinando’s. A lightly fried ball of rice that gets dredged in breadcrumbs, filled with ground beef, peas, sauce and mozzarella, then topped with ricotta and covered in a beautiful russet-colored tomato sauce and parmesan cheese. You will be sad to see it go when you’re done and reaching for napkins. Next up is the panelle special. Deep-fried and thinly sliced chickpea-flour fritters that get placed on a soft homemade bun and, of course, topped with that silky-smooth ricotta. 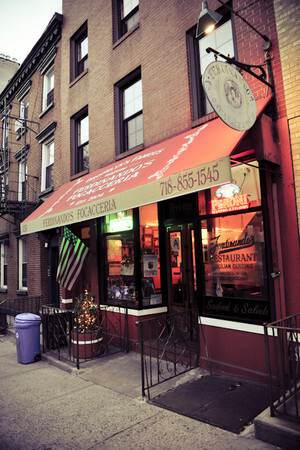 Once labeled “the food of poor people,” Ferdinando’s continues to play a big part in the revitalization of Sicilian cuisine. 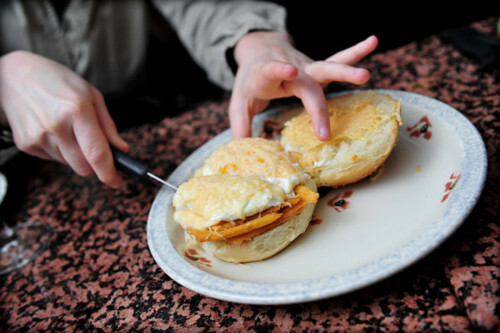 “The panelle is specialty now. It’s a very unique specialty. And if you want it, you have to appreciate it. Because this is what we do,” Francesco says. Francesco would love for his sons - Christian, Francesco and David – to take over the business. The youngest, David, just graduated from St. John’s University with a degree in finance, and has been working at the restaurant on weekends. David is up for the challenge, he says it to me point-blank. Then he asks if I’ve ever had a Manhattan Special on tap. Nope. He drops ice cubes into a glass, runs it under the fountain, watches my face as I take that first gulp. “So vintage, right?” he asks, his eyes lighting up. 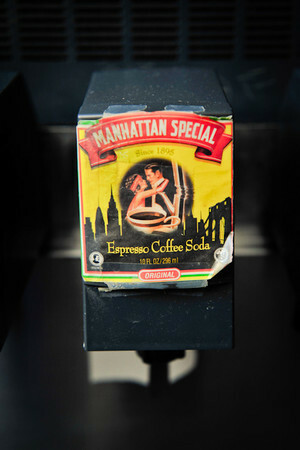 Blame it on the magic of a Manhattan Special, but I believe David Buffa. If I could send you all to Palermo to meet Rocky at the Vucciria Market for a 3-euro pane ca’meusa, believe me, I would. But I think I’ll settle for the more practical option and send you all to Ferdinando’s for a little taste of Palermo in Carroll Gardens.